By Kori ~ August 15th, 2012. 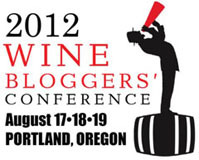 This weekend, Dad (John), Colby, and I will be attending the fifth annual Wine Bloggers Conference in Portland, Oregon. We are glad that this yearâ€™s conference is being held in the Pacific Northwest and look forward to joining our fellow wine bloggers as well as other members of the wine industry for three days of meeting, greeting, learning, sharing, and of course, tasting. The conference boasts an action packed agenda including breakout sessions, keynote speakers, visits to local vineyards and wineries, and tastings. Just like in previous years, Iâ€™m sure we will have much to share with you all when we return. If you are interested in live updates during the conference, be sure to follow me on Twitter, @winepeeps, as well as the conference hashtag, #WBC12.